June through November is hurricane season in the Caribbean. An average of seven times during this period, a trough of low pressure out in the Atlantic Ocean develops into a tropic depression with winds up to 35 knots. As the pressure drops and the atmosphere becomes unstable, the wind speed increases above 64 knots. These extreme low-pressure areas are called “hurricanes” which are graded from one to five, with five being the most severe. Most occur in September, travel south of the Bahamas and up the East Coast of the United States. 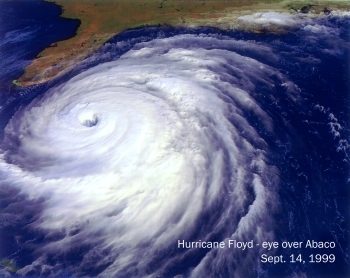 On September 14, 1999 a grade 4/5 hurricane called “Floyd,” 600 miles in diameter with winds gusting over 200 mph, passed directly over the Bahamas. 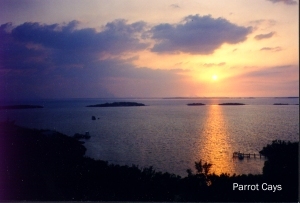 Hardest hit was Abaco, a chain of islands forming the eastern border of the Sea of Abaco, one of the premier sailing areas in the world. For 12 terrifying hours, people huddled in their homes fearing for their lives. Many homes and businesses were totally destroyed while docks and boats were tossed ashore like matchsticks. Miraculously, no one was killed or even seriously injured in what has been described as the worst storm of the century to hit the Bahamas. This is the same hurricane that killed 61 people as it made its way up the East Coast of the United States. 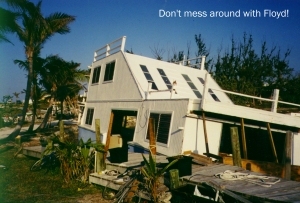 The Bahamas have been ravaged by many hurricanes over the years. There were the infamous 1926 and 1932 hurricanes, Hurricane Betsy in the 60’s, David in the 70’s, Andrew, Dennis, and Floyd in the 90’s. They are as much a part of life in these islands as the serenity of the sun, sand, and sea. But when the local folks talk about “the hurricane,” they are referring to Floyd. 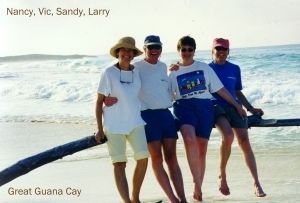 Having sailed in Abaco some 20 years ago, my partner Sandy and I were considering another trip to the same area eight months after the hurricane (April, 2000). Naturally, we were concerned about the effect of the storm on our charter. We contacted Florida Yacht Charters and before we could say “brand new 41-foot Hunter with air conditioning,” we were on one! 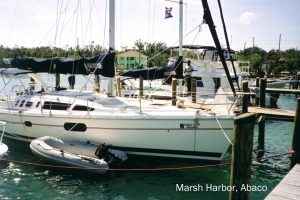 Florida Yacht Charters has one of their several bases in Abaco with numerous sailboats, catamarans, and motor yachts available for chartering. Joined by our friends, Vic and Nancy from Nassau, we spent a week sailing from island to island talking to as many local people as possible about the hurricane. We asked what they remembered most, what effect it had on them personally, and whether they thought things were “back to normal.” We also noted the condition of marinas, anchorages, beaches, restaurants, and any services related to recreational boating. Getting to Abaco for a boat-charter requires a 100-mile flight from Florida to Marsh Harbour, the regional centre of the islands. From the airport, it’s a short taxi ride to the marina, which serves as home base for several charter companies. However, because of the destruction of the marina by the hurricane, we caught a 20-minute ferry ride to Elbow Cay where Florida Yacht Charters had set up temporary quarters. During our week, they were busy relocating their boats back to newly rebuilt docks at Marsh Harbour. Following a thorough boat orientation by Bareboat Willy and a chart briefing by Captain Russ on the morning after our arrival, we motored into the calm waters of the Sea of Abaco for a shakedown cruise. The first thing we noticed was the crystal clear turquoise water. Then we looked at our depth meter and realized the water was only 10 feet deep. For those used to sailing off the west coast of Canada, 10 feet means you’re either in a harbour or about to run aground! The shallow water and visible bottom is somewhat disconcerting for the first-time boater with 5 1/2-foot draft. Piloting is done mostly by eye, judging the depth of water by its color. A bow watch is particularly helpful when entering harbours or approaching anchorages. A GPS is useful, as is working with the tide tables to give you an extra foot or two. We soon became comfortable with the reliability of the chart soundings and the knowledge that the bottom is mostly sand and very forgiving. An indispensable aide was our Cruising Guide to Abaco 2000, which provided detailed charts with magnetic course lines to wherever we wanted to go. My advice is …don’t leave harbour without it! 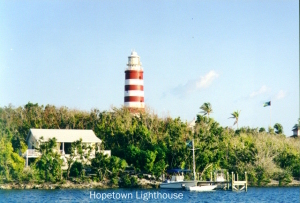 During the week, we visited many scenic villages and beautiful beaches, climbed the lighthouse at Hopetown, shopped for canvas bags at Albury’s Sail Shop on Man-O-War Cay, visited a museum in New Plymouth on Green Turtle Cay, and snorkeled with dolphins at Fowl Cay. Most of the locals had similar recollections — “sounded like a freight train, very scary, shook the house, tore off my roof, flooded my living room, uprooted trees, destroyed my dock, sank my boat, and so on.” Many wandered outside when the eye of the storm, about 20 miles wide, arrived. Moving at 15 mph, this calm period lasted just over an hour, then winds reversed from NE to SW, causing even more destruction than the first wallop. On Elbow Cay, a strip of beach with eight houses was totally obliterated by a tidal surge across the narrow island. Man-O-War Cay, just four miles away, suffered much less damage. According to one older resident, “that’s because our homes were constructed by ship builders on rock foundations.” On Green Turtle Cay, a family covered their children with a mattress while the adults held hands and prayed. A shop owner at Hopetown on Elbow Cay said that the real story was not the hurricane, but the way people pulled together in the weeks after to help the less fortunate. Volunteers set up an Abaco Relief Command Post in West Palm Beach, which shipped 800 tons of emergency supplies in the first week of operation. Other donation centres were established in Fort Lauderdale and Miami and several shipping companies donated cargo space to ship hundreds of tons of supplies from these locations. Bahamian workers and volunteers labored long and hard to re-establish power and phone services within days after the storm. 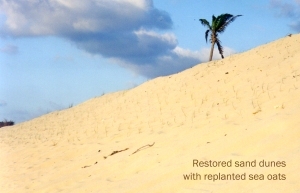 Even the 20-foot high sand dunes that were obliterated on Elbow Cay were rebuilt through the co-operative efforts and donations of many caring volunteers and local groups. A number of excellent reviews have been written in various boating magazines about this popular cruising area. My intent was not to repeat or expand on these stories. Instead, I wanted to give readers some sense of the human and physical impact caused by a storm of this magnitude. Certainly, the extent of personal suffering and physical destruction can never be captured by the written word and was far greater than I have depicted here. However, based on our observations and discussions with a small sample of those who were there during “the storm of the century,” I would say that things are pretty much back to normal in Abaco, at least in the area we visited. Some things are even better than before. Marinas have been rebuilt with new docks, new washrooms, and upgraded services, many restaurants have been improved as a result of their renovations, and people seem more upbeat and optimistic than I recall 20 years ago. Such a positive outlook often occurs when people survive a catastrophic event and pull together in the process of rebuilding. In brief, serenity has returned to Abaco. If you’re planning a boating holiday, you definitely should consider this tropical paradise. The sun is once again shining, the breezes balmy, the seas calm, and the people, well, let’s just say they’re survivors who have made these pristine islands a better place in the wake of a monster named Floyd. Florida Yacht Charters & Sales, Inc. Copyright © 2019 Larry MacDonald. All rights reserved.